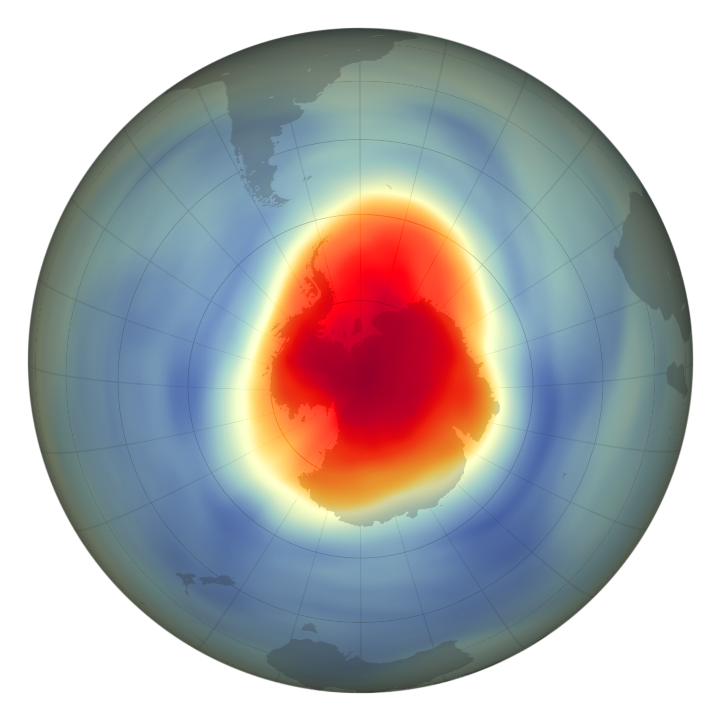 The hole in the ozone layer that forms over Antarctica each September and October was slightly above average size in 2018, but smaller than expected for the weather conditions. 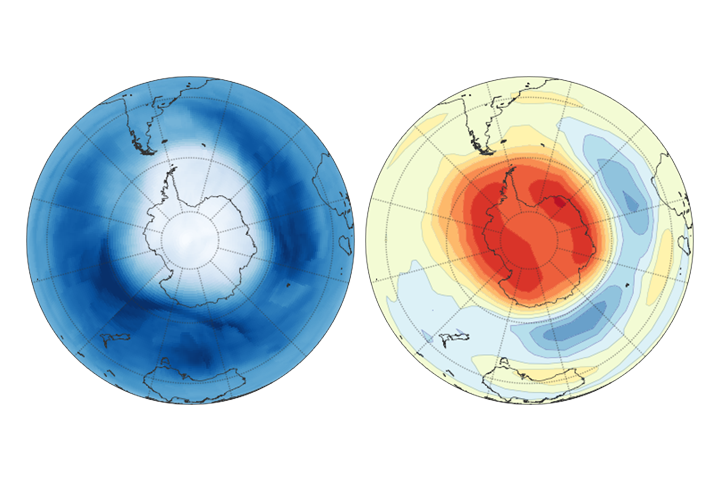 Colder-than-average temperatures in the Antarctic stratosphere created ideal conditions for destroying ozone, NASA and NOAA scientists said, but declining levels of ozone-depleting chemicals prevented the hole from growing as large as it might have been 20 years ago. 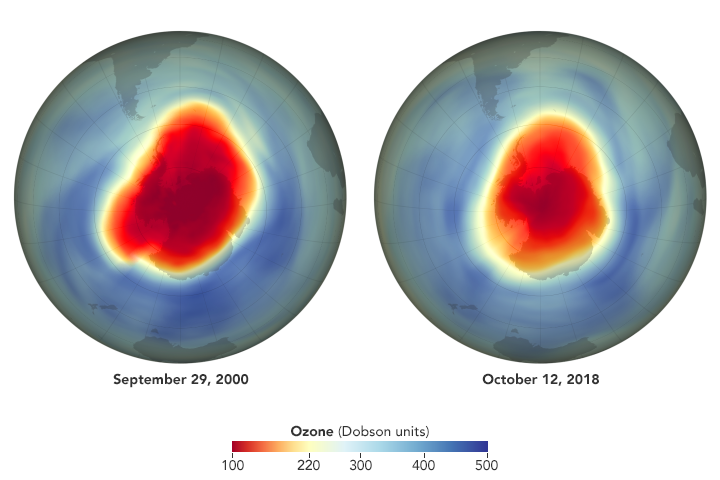 The ozone hole reached an average area of 22.9 million square kilometers (8.8 million square miles) in 2018, almost three times the size of the contiguous United States. It ranks 13th largest out of 40 years of NASA satellite observations. 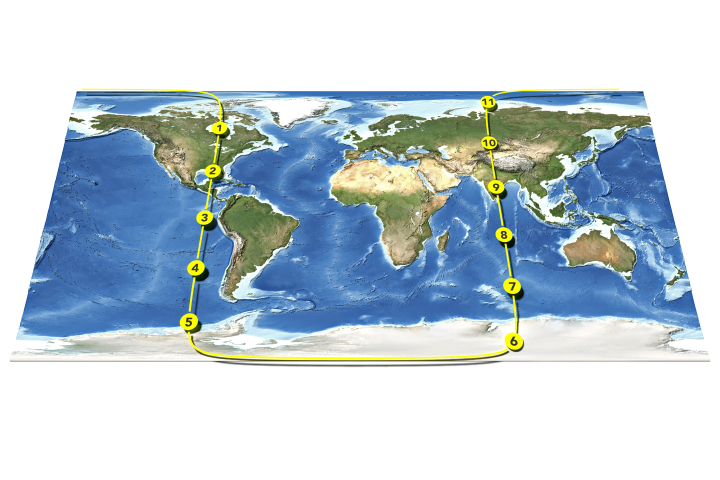 The maps on this page show the state of the ozone hole on the day of its maximum depth; that is, the day that the lowest ozone concentrations were measured in those years. 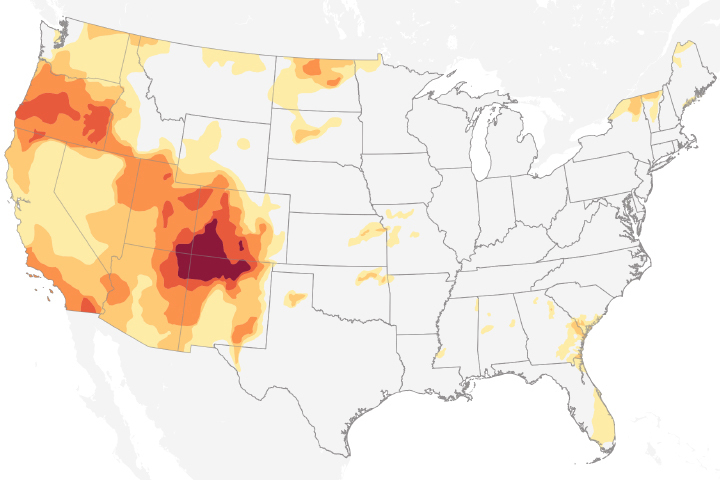 The maps at the top of this page show 2000 and 2018, when ozone concentrations were 89 Dobson units and 102 Dobson units, respectively. The series below shows the day of minimum concentration in every year since 1979 (except 1995, when no data was available). Stratospheric ozone is measured in Dobson units (DU), the number of molecules required to create a layer of pure ozone 0.01 millimeters thick at a temperature of 0 degrees Celsius and an air pressure of 1 atmosphere (the pressure at the surface of the Earth). The average amount of ozone in Earth’s atmosphere is 300 Dobson Units, equivalent to a layer 3 millimeters (0.12 inches) thick, about the height of 2 pennies stacked together. 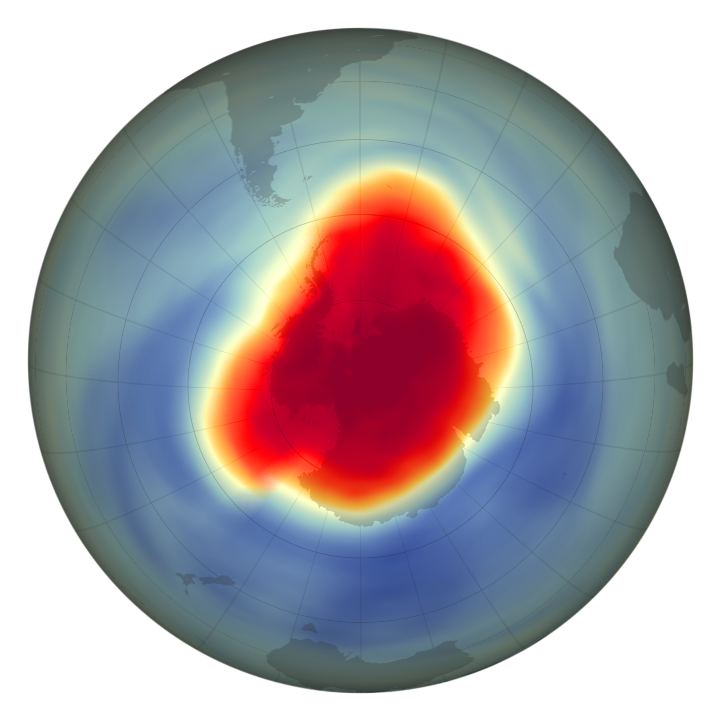 The ozone hole in 2018 was strongly influenced by a stable and cold Antarctic vortex, the stratospheric low-pressure system that flows clockwise in the atmosphere over the continent. These colder conditions—among the coldest since 1979—helped support the formation of more polar stratospheric clouds. Particles in such clouds activate ozone-destroying forms of chlorine and bromine compounds in the stratosphere. 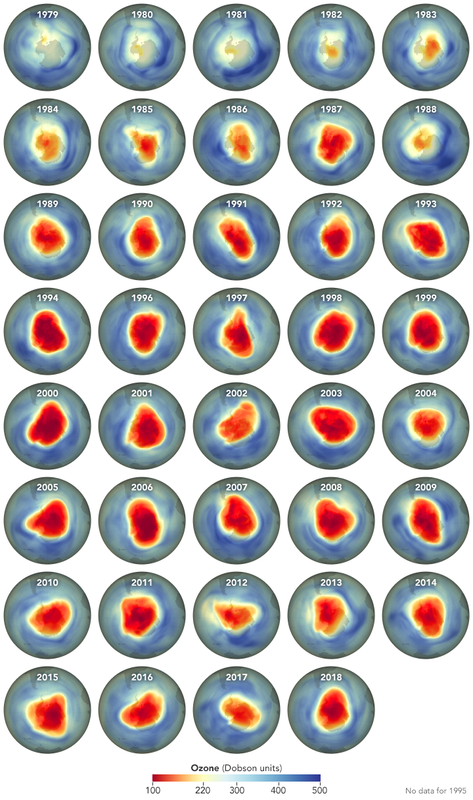 The ozone hole was quite large in 2018 because of the cold conditions, but less severe than it might have been in previous decades. 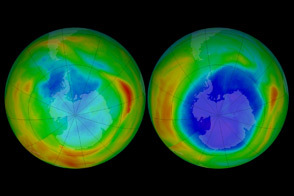 The difference is a long-term reduction in ozone-depleting substances (such as chlorofluorocarbons, or CFCs) that were phased out of commercial production by the Montreal Protocol. Atmospheric levels of CFCs and similar compounds increased up to the year 2000, but have slowly declined since then. Ozone-depleting chemicals in the air are abundant enough to cause significant losses. According to NOAA scientist Bryan Johnson, conditions in 2018 allowed for a significant elimination of ozone in a deep, 5-kilometer (3.1-mile) layer over the South Pole. The South Pole saw an ozone minimum of 104 Dobson units on October 12, making it the 12th lowest year out of 33 years of ozonesonde (balloon) measurements at the Pole. NASA Earth Observatory images by Joshua Stevens, using data courtesy of NASA Ozone Watch. Edited by Mike Carlowicz using a story by Ellen Gray, NASA's Earth Science News Team, and Theo Stein, National Oceanic and Atmospheric Administration. NASA (2018) NASA Ozone Watch. Accessed November 13, 2018. NASA Earth Observatory (2012, September 18) Watching the Ozone Hole Before and After the Montreal Protocol. 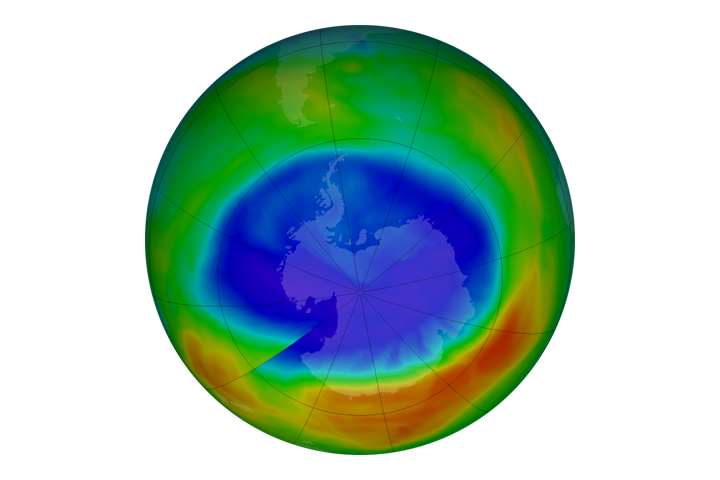 NASA Earth Observatory (2009, May 13) The World We Avoided By Protecting the Ozone Layer. NOAA Earth System Research Laboratory (2018) Twenty Questions and Answers About the Ozone Layer. Accessed November 13, 2018.